We are inching along here in my kitchen, making progress bit by bit! And of course, when I say “we” I mean the contractors. Even though I have contractors doing much of the work, I’m busily supervising, making more decisions and even changing my mind sometimes as they are working. They love that. So today it is time for another little iphone update on how things are coming along! The grout went in for my subway tile yesterday and I’m very happy with the color! 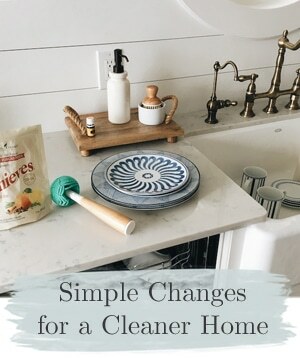 It is impossible to really judge how things will look in the kitchen because obviously the cabinets and trim are not painted yet and there are dozens of little things still left to do and add that will continue to alter the overall look. But, nevertheless, progress is fun and nothing has gone terribly astray yet! 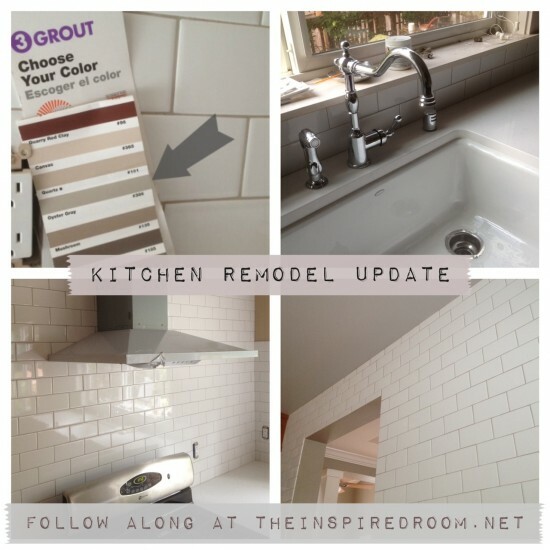 I’ve had a few questions about the grout color we were going with so I thought I might as well talk about that now since we just had ours put in yesterday. I really wanted a bit of a gray tone, but nothing cold or dark. The color we ended up with is called Oyster Gray #386 from Polyblend. 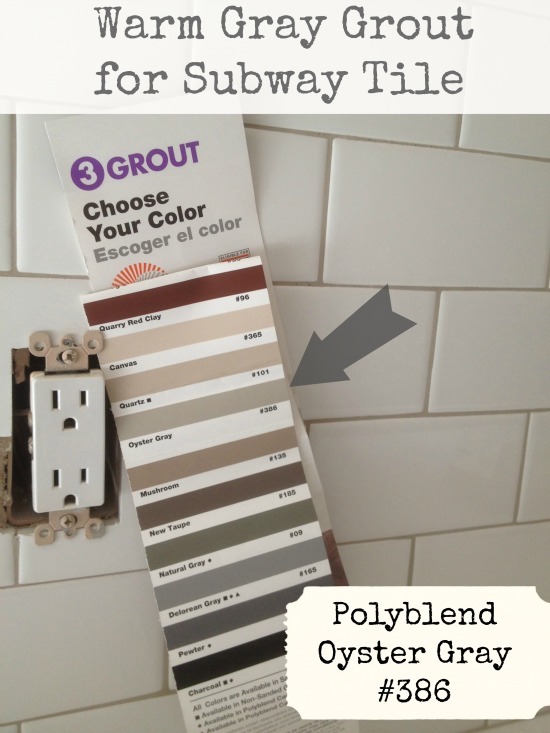 I prefer a pretty tiny grout line because it makes it easy to keep the grout looking clean and it is easier on the eyes. Because I like a little texture and a little age to my grout, Oyster Gray works perfectly to achieve both. It is a very pleasant grayish color, kind of reminds me of my Studio Taupe wall color. If you are at all concerned about grout getting dirty in a kitchen, there is really no need to worry! A small grout line, a color other than white, and a grout sealer pretty much make grout issues non-existant. Even if you go with white and a grout sealer, it really isn’t that hard to clean! 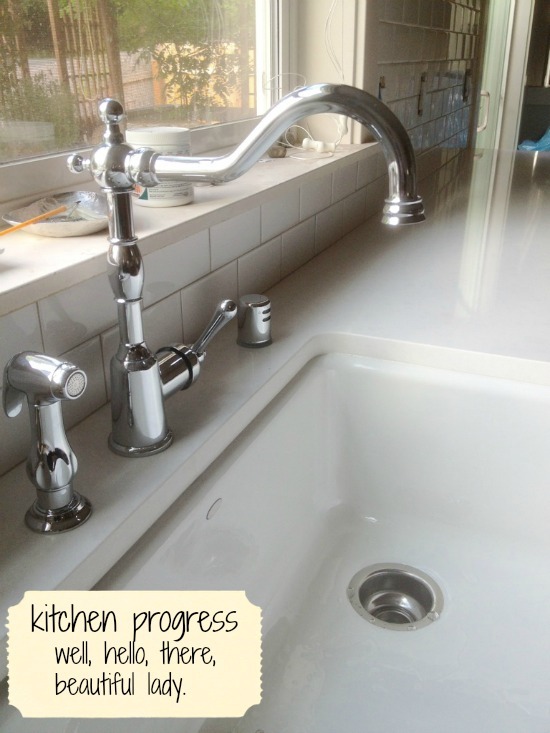 Yesterday we also had our faucet installed! I LOVE IT! The faucet brand is Danze and the quality is really nice. I’m waiting for a new faucet for our water filter so that is still stainless (it is actually out of the picture.) That little gizmo to the right of my faucet is something to do with the dishwasher and I have no clue what it is. I’ve never had one before? And also, my dishwasher couldn’t be installed yesterday because of a broken hose. Delays. Oh well. 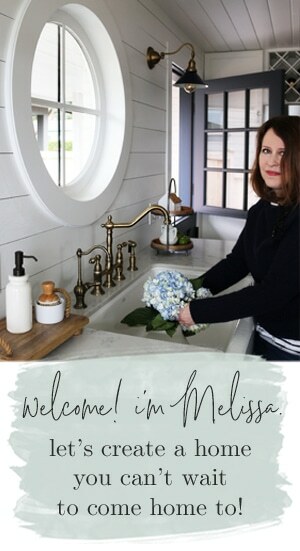 I will admit the faucet is not as substantial feeling as the Rohl (the one I had in my last house) but the cost difference was so significant I’m going to be happy as a clam with this beautiful lady. 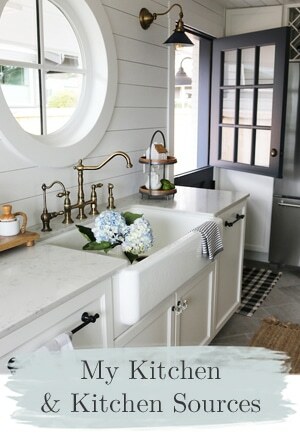 I’ll talk about mixing finishes in this kitchen more in a future post, but the faucet is chrome, basically because I like shiny and wanted a bit of bling at the sink. My existing appliances are stainless and for budget reasons, they are staying. We didn’t go with nickel for our faucet because of the added cost, even though that is really my favorite. Everything doesn’t have to be my ultimate favorite for me to be happy with it, I’m definitely trying to keep costs under control and cutting where I can compromise. 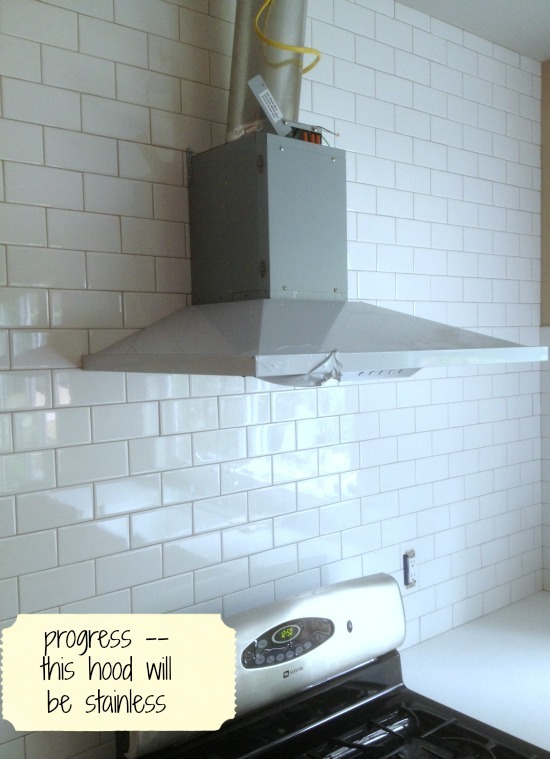 And lastly, we are part way done with the vent hood installation! It still has its white plastic protective film on it which makes it look different so that is NOT what it will look like (it is stainless, not white and no wires will be sticking out). The metal box that goes around the pipe thing there isn’t on so this is just a progress picture. Wednesday they are hooking up the electrical so it will work! The hood vent is a Zephyr, same brand as my other house. Only this one is bit smaller than my last one (this one is a 30 inch) because my cooktop is smaller in this house and it was the size that didn’t require more holes in my ceiling and walls. Again, trying to keep this project from adding up with too many extra costs wherever I can! It is important to get a hood vent at least the size of your range so don’t get one too small just to save costs, it won’t be worth it in the end. 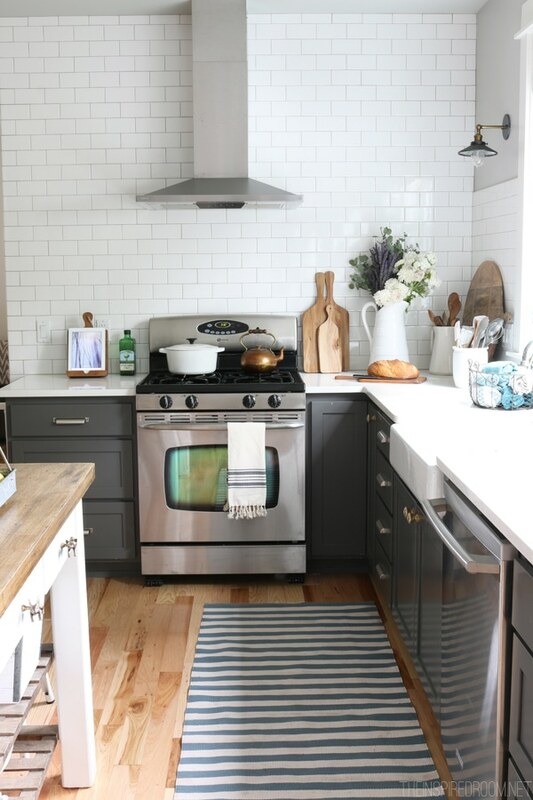 I really like the low profile of this hood (even though it is exposed and not encased in cabinetry) and am happy it doesn’t overwhelm tile wall. It still has that industrial kitchen kind of look without being enormous. 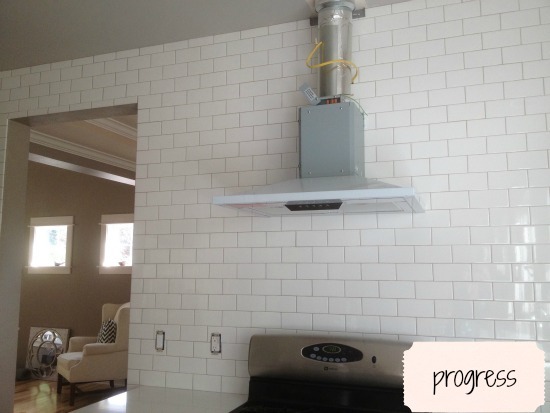 There will be nothing else on that tile wall, I want it to be as clean and uncluttered as possible. I can always add accessories later but for now I just want a clean slate! So, tomorrow they finish up the vent, hopefully my dishwasher will get installed this week and then I’m waiting on a painter! 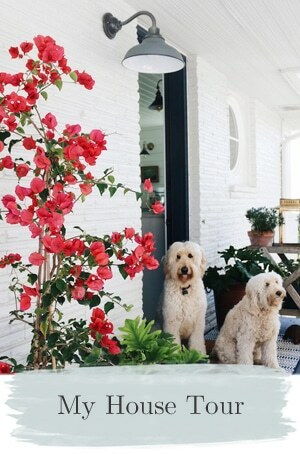 There will be lots more to work in though addition to the cabinet paint (cabinet hardware, window shades, wall paint, the pantry, the floors, the freestanding island, installing the sconces and more work in the family room). Feels like the finish line is still a long ways off but basically my kitchen is getting close to being functional again with a sink, stove and dishwasher! And the next leg of the journey will be kind of fun, right? I love the finishing details. I’ll be back soon with more updates! Right now I’m finalizing the color of the cabinet paint and deciding on the hardware! I’ll do a post on that too! Thanks for following along! You can read back to all the previous kitchen renovation updates here. 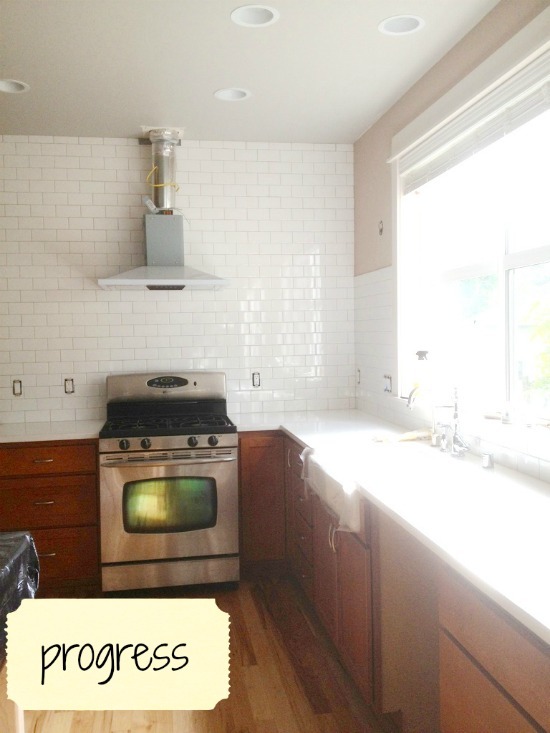 And…see my white kitchen reveal in my NEW house in Seattle HERE! I have shopped for countless newborns and baby gifts over the years. Have you? 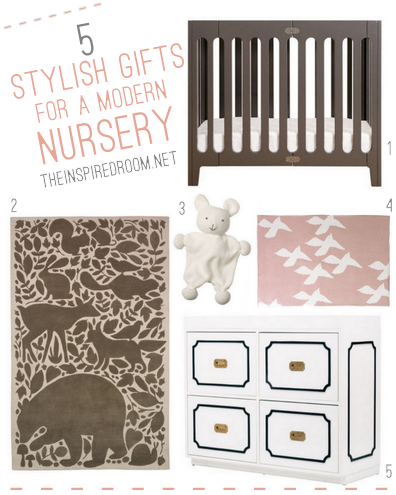 I love giving baby gifts, but I can say that finding stylish unique baby items has often been a challenge for me. I especially love that first year, from newborn to one, when mamas are so excited about their babies, furnishing their nurseries, dressing their cherubs in cute little outfits and looking forward to planning the first birthday party! So fun! You just want everything to be perfect, and rightfully so, it is a special time in life. And for those of you grandmas out there, you must be in HEAVEN getting to shop for those little grandbabies! Oh my, I can only imagine! We are starting a MOPS group (Mothers of Preschoolers group) at our church this fall and I can’t wait to be surrounded by sweet babies and their mamas! Lucky me! If you are a new mama yourself or know some new moms who are just setting up a nursery or planning a first birthday, I thought you might be interested to hear about this neat online gift finder and registry I just recently found out about called Giggle. I love this concept because they’ve already sifted through all the junk and so-so to bring together only the best items for babies. I have had so much fun shopping through their site, window shopping and dreaming about babies. Giggle has seriously cute things (I think I might have to put together a few more collages of my faves because it was impossible to narrow it down). 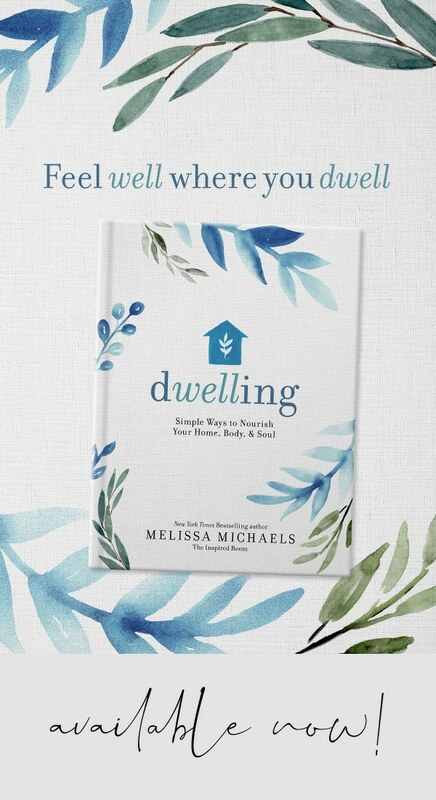 It is so easy to find and give what you want without all the hassle. From nursery gear to clothes to carseats to toys, they have it all. You can set up and share your own baby registry, update it online or on your phone, send gift cards or find the perfect gift for baby, all from this one stop shopping site for parents and grandmas, too! Sound fun? I think so! 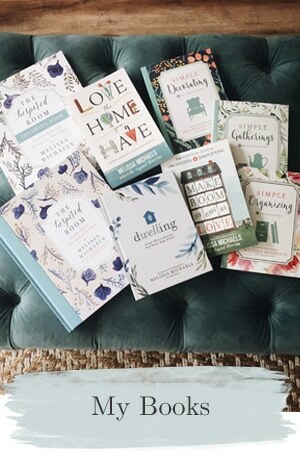 Are you a new mama or new grandma or know ladies that are? Check out Giggle.com and let me know what you think, would you? Let’s talk about BABIES and BABY NURSERIES! What’s your favorite baby item? Discount code for readers: $15 off a purchase of $75 giggle’s Better Basics Layette collection with a special discount code, LINQ12 through September 15, 2012. This post is sponsored by Giggle.com but my love of babies and stylish baby items comes straight from my heart.